Dundee United are to reinvest some of the cash they raised from selling Andy Robertson and Ryan Gauld in an attempt to ensure a flow of more young talent. 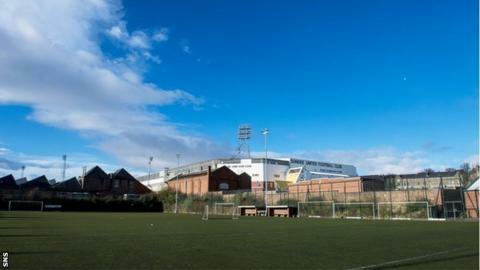 United are set to spend £300,000 installing a new two-star synthetic surface to upgrade their training facility opposite Tannadice Park. "The Arab Trust and the Federation of United Supporters have been a great support in this and they have contributed a substantial five-figure sum to the redevelopment of Gussie Park." United sold Scotland Under-21 midfielder Gauld to Sporting Lisbon for around £3m, while full-back Robertson has gone on to win full Scotland caps since switching to Hull City for £2.85m. Work on the new pitch will start in November, with United hoping to have the playing surface and upgraded changing facilities up and running by February. Thompson said the pitch will meet the same Uefa standards required for Champions League matches. He also paid tribute to United fans groups who have contributed to the fund-raising effort. "The Arab Trust and the Federation of United Supporters have been a great support in this and they have contributed a substantial five-figure sum to the redevelopment of Gussie Park," he added.